Answers to some of the most common questions asked by BankPlus users. How do I install BankPlus? and your web browser should ask you to download it to a particular folder. Find the file that you have just downloaded. If you don’t know which folder your PC has downloaded it into, do a ‘Find File’ and search for “bankp”. use is probably WinZip. Click here to go to the WinZip Website. Once unzipped, you should have a file called bankplus.sis – this is the installation file. Connect your EPOC machine to your PC with the PsiWin lead On your PC, double-click on the bankplus.sis file. This will start the EPOC Install program, which will copy the required files to your Psion. Click on your Psion’s Extras button, you should see a new icon, “BankPlus”. Tap on this to start the program. If you do not have access to a PC with PsiWin, you may need to install a program called instexe.exe (supplied by Psion) onto your Series 5/5mx/Revo. Copy this file onto your Psion machine, and then select and run this file to install support for SIS files (the format used for software distribution) on your machine. You can then copy the bankplus.sis file onto your Psion and install BankPlus by double-tapping. The instexe file can be downloaded by clicking here, from Psion, or on the Palmtop Magazine CD. Go to the Download page and select the appropriate file to download. Click on this file, and your web browser should ask you to download it to a particular folder. Find the file that you have just downloaded. If you don’t know which folder your PC has downloaded it into, do a “Find File” and search for “bank”. Once unzipped, you should have three or four files – these are the files which you now need to copy onto your Psion. Copy the files that you have just unzipped into the \APP\ directory on your Psion. If upgrading from an older version of BankPlus, overwrite the old files with the new files when prompted. From your Psion’s ‘System’ screen, select ‘Install’ from the ‘Apps’ menu, and move to the Bank OPA file (called either Bankplus.opa or Banks.opa), using the cursor keys. Highlight “BankPlus” and press [Enter] to start the program. Find the item you are looking for (Psion-F). Press Psion-U for update or Psion-D for delete. You can also select these options by pressing [Menu]. From View (Psion-V), select the item that you are looking for. Press Psion-U for update or Psion-D for delete. You can also select these options by pressing [Menu]. apply a credit of the new balance in Euro. This feature can be accessed from the Tools | Import | Account data option. For information on ways to register, click here. other to credit the receiving account. The latest versions of BankPlus are available from the download page. Provided you haven’t changed machines (in which case, see below), then installing a newer version of BankPlus is straightforward. back up your data.For a list of what’s changed with each release of BankPlus, see the History page. Settings files cannot be transferred, so you will need to re-input account & category names. Ensure that BankPlus on the Series 3 family/Siena is not running. From under the OPO icon, select BP3EXP and run the program. 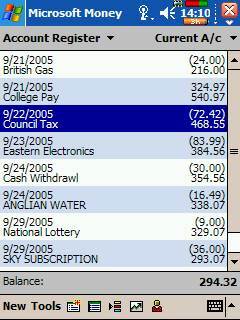 Select whether to export an Account, Standing order file, or an Archive file, and press Enter. Repeat this procedure for each account. Run BankPlus. You will need to manually create each account if they do not already exist. Open the first account that you wish to import data to. Run “Import” from the menu and select the BP3 file which corresponds to the account. Repeat the above for each account you wish to import. Repeat the same procedure for standing order export, but select the file BANKSO.ODB. Exporting BankPlus archive files (.bpa) is also supported in v2 of the BP3EXP.OPO application. www.reg.net quoting ID 4155 (Series 5/5mx) or ID 6764 (Revo). You must supply your existing Series 3/3c/Siena code prior to registration. Note that Reg.Net add a small handling charge. from the ‘Settings’ option. To back up, or move your accounts, copy the entire contents of this folder. In addition, there is a settings file which you also need to copy or backup. This file is called bankset, and is located in the c:\System\Apps\Bankplus folder. In the event that you can’t see the System folder, go to your Psion’s main system screen and from the menu, select Tools | Preferences \ Show ‘System’ folder. PC, Nokia 9210 or Palm OS versions? Now that the Psion machines are no longer in production, we’re frequently asked whether BankPlus will be made available for other types of machines. Unfortunatly, the answer to this is currently a “no” – partly due to the time needed to create versions in other programming languages, and partly due to the fact that there are already a range of financial products for these platforms. Here are a few specific bits of information that may be of use. Microsoft Money? If you are using a Pocket PC device, you might want to consider using the Pocket PC version of Microsoft Money, as this is a free download companion to Microsoft’s desktop Money program. You use your PC to manage your accounts, and when you synchronise your Pocket PC to your PC, your financial information is exchanged authomatically. Existing BankPlus users wishing to move to Microsoft Money on the PC will find that existing data can be transferred using Money’s Quicken Import option. not been optimised for use on these machines, and there are currently no plans to develop versions for these devices. to make BankPlus account files recognisable by the operating system. Accordingly, new files created with version 1.8 or above will have a BankPlus icon, but older files won’t. This change makes it easier to identify BankPlus files, and allows a restart after a backup operation. if you find BankPlus beginning to slow down due to the amount of data you have in an account. You can select one or all accounts to “tidy”, and specify a date range, before which all entries will be deleted. You should normally only “tidy” items that have been marked as “cleared”, otherwise your cleared balance may be affected. prior to “tidying” accounts. The action of “archiving” then “tidying” an account will means that BankPlus will have less data to sort through, so will speed up, but if you want to look back over old transactions, they’re still available via the archive file. Archive files can be searched, and added to, but they hold no balance information. An “archive” does not delete data. You have cleared an item in the future (you should not clear an item until it has appeared on your bank statement) Check this by using Find to look for any entries beyond today that are not set to “uncleared”. If you find an item that has been cleared by accident, editing this item to become “uncleared” will resolve the problem. There is an item outside the date range that you are expecting (maybe you typed in the wrong year). Try doing a “find” for the item, setting the date to 1/1/1900, and the ‘items’ field to “all” – that should find the rogue entry. There is a duplicate entry, probably in the items you cleared most recently. Try looking at a list in “View” to find the duplicate. Work out how much you are “out” by, then use “Find” to search for the amount. If you still have a problem, please email the appropriate BANK0x.ODB file, so that I can search for the rogue entry. This obviously means sending me data that may be confidential, whcih you may not wish to do. If this is the case, the workaround is to enter a “dummy” item for the amount needed to correct it, and then clear and delete the entry. To delete a category, empty the “Category name” and “Abbreviation” fields. BankPlus comes with a converter to allow export of your BankPlus account data to text files in a format that can be recognised by many PC applications. If the format doesn’t suit your needs, you may need to use a text editor (such as Windows notepad), to change the format or delimiters. On a Series 3a/3c, if you find that your menu doesn’t have an “Export” option ,then it’s likely that you’re missing the BANKPLUS.PRG converter plugin. Download the latest version of BankPlus and copy the BANKPLUS.PRG into the \APP\ directory with the rest of the application files, then restart BankPlus. Current versions of BankPlus support the Quicken 2000 method, however if you are having problems, you can open up the QIF file with your PC text editor, and use the “replace” feature to change ’03 to /03 if needed. For more details of the QIF file format, go to Intuit QIF page. Also, see a discussion thread on this here. OPL (their programming language) at this time, which means that it is not possible to print from BankPlus direct to a printer via PsiWin. The official workaround is to use the RPRINT.EXE file supplied on Disk One of the PsiWin set of disks. This is a DOS executable program. The other option is to print to a text file, open the text file in Word, and use Word’s ‘Print via Psiwin’ option. on. Exit BankPlus and go to the system screen (via the system button). Press Psion-L. At the Communications screen, set “use” to “None” and not “Link Cable”. If printing via a PC, see the FAQ about PsiWin printing. I’ve changed my standing order amount, but entries haven’t changed. future standing order entries and is not advised. The Archive facility in BankPlus allows for you to search through an archive for a particular transaction. If you wish to do more with your archive file, you can convert an archive file (.bpa) to a file that can be used by another application, such as a spreadsheet. Use the small stand-alone application BarcConv, which is available from the Download page to convert your bpa file to a comma or tab delimited file that can be imported into programs such as Psion Sheet or a desktop application such as Excel. BarcConv runs on the Revo, Series 5 and Series 7 families. check the “offset to zero” option. BankPlus for the 3a/3c/3mx, Siena, Series 5/mx and Revo family are all Year 2000 compliant. 5) or WRD folder (Series 3/Siena), to the author.